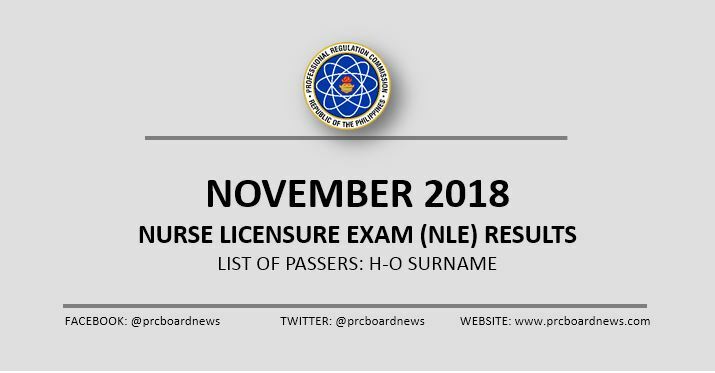 MANILA, Philippines - The Professional Regulation Commission (PRC) and the Board of Nursing (BoN) are expected to announce on on Friday, December 7, 2018 the results of November 2018 nurse licensure examination (NLE) or nursing board exam given in several testing centers all over the country. The full list of passers, alphabetical roll of passers for H to O Surnames, for the recent nursing board exam is available here. According to PRC Resolution No. 2017-1068, the target release of NLE results is on Friday, December 7, 2018 or in fourteen (14) working days after the exam. The results day falls in 19 calendar days. The computed number of working days excludes 2 Saturdays and Sundays and 1 public holiday (Andres Bonifacio Day). We advise examinees to monitor announcement of results starting Monday, December 3. This is in reference to the previous five exams in which results were released between 8 to 12 working days. PRC Board News will update this page immediately once results are out online. You may also monitor release of results on PRC's official website (prc.gov.ph).